Great Britain head coach Charles van Commenee said he had achieved his goal after his team met the target of seven medals at the World Championships. But he admitted there is work still to do before the London Olympics in 2012, when the target is eight. 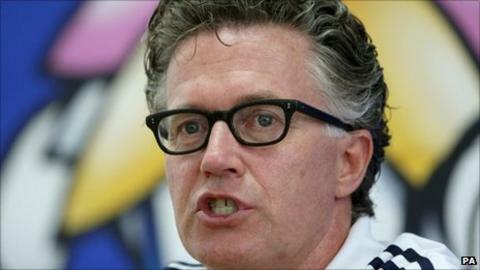 And he described the performance of the men's 4x400m relay team in their final as "appalling, unforgivable". "Of the athletes that should be close to medals a number have underperformed," he told BBC Sport. "That's disappointing but at the same time I've always said that at the end of these championships we wouldn't have a finished product. In men's track events, Britain had no representative in the final of any event from 100m up to 1500m. Had it not been for the hurdlers - Dai Greene's gold medal in the 400m and a bronze for Andy Turner in the 110m - and Mo Farah, the absenteeism would have become embarrassing. "I said we needed three-and-a-half years, not two-and-a-half, and it shows. "The good thing about now is that I know what to do. It's not finished, there's work to be done and I know where to identify the ones who didn't perform." Van Commenee was clear before the event began in Daegu that he would be happy with seven medals, including one gold. Dai Greene took GB's other gold, while the third favourite, heptathlete Jessica Ennis, had to settle for silver. That put Great Britain sixth in the medal table, behind the United States, Russia, Kenya, Jamaica and Germany. The team's gold-medal count is one short of their best World Championships, in 1993, when they won a total of 10 medals. However, the number of Great Britain athletes in finals has been disappointing, with few achieving personal or even season's bests. No Britons, either male or female, reached finals in the 100m, 200m, 400m or 800m. "Of course I'm disappointed, especially in the jumps and the men's relays," Van Commenee continued. Having qualified well for their final, hinting at a possible medal, the men's 4x400m relay team ran slower in the final, finishing seventh. Greene had been expected to join the quartet for the final race but he pulled out ill during the warm-up. "The 4x4 was appalling, no real effort, unforgiveable really, and of course we expected an athlete in the 800m final for women," said Van Commenee. "There are disappointments but two-and-a-half years ago, if I could predict we would have seven medals, I would have been very happy with that. "We'll look into it very critically. In brief conversations I've had, they gave me the answers I wanted to hear. I'm positive but I know it's not a given yet. We need 11 months to turn it around," he continued. "We knew this is not the Olympic Games. We need 11 months and we'll use them." Van Commenee mentioned two teenagers, 400m hurdler Jack Green and pole vaulter Holly Bleasdale, as athletes he expects to star in the future, having made debuts at the top level in Korea, saying: "They haven't competed well but they have the talent."